The evolving nature of giving came to mind, as the kids and I played Settlers of Catan today, a game whose premise is society-building. In the past, our notion of giving rooted itself very deeply in the survival of a community. It was absolutely imperative that the members work together. Lacking a safety net of any kind, small villages and towns had to share resources – food, fuel, labor – in order to survive. Most often, the extended family was the community, but neighbors joined together as well. Sharing a meal was more than just a good time, it was a time to reaffirm solidarity. It took place at a time when there weren’t any 24-hour grocery stores, or hardware stores with everything. If it was to be, it had to be built or made, and that took a lot of help. In short, a lot of giving took place out of need. Today, for most of us, those basic survival needs are met. A lot of food is pre-cooked. A lot of repairs are handled by professionals. Thus, the impact of traditional holiday giving has somewhat faded. If the need has diminished, what happens to the nature of giving? It changes too. We can continue the traditions of gift-giving, holiday baking and shopping, but with the knowledge that they are comforting, not necessarily needed. To give a meaningful gift today requires something more. It takes observation, listening, courage and time. Observation – Careful observation of people’s actions can help us see what is truly needed. If someone has to walk a 1/2 mile to the bus stop everyday, a ride might be nice. Listening – People often don’t express their needs. Listening carefully to recurring patterns in their words can help us help them. Courage – It takes guts to give something unexpected. It takes courage to acknowledge that your offer may not be accepted or your gift may not be appreciated, especially if it’s new. However, your gift also may change someone’s life. Time – Don’t expect to give meaningful gifts or help without investing time in the other person. That is time well-spent. As society changes, meaningful giving will change as well. There’s no need to stay rooted only in traditional giving. Traditional giving serves as a comfort, but meaningful giving requires a bit more. 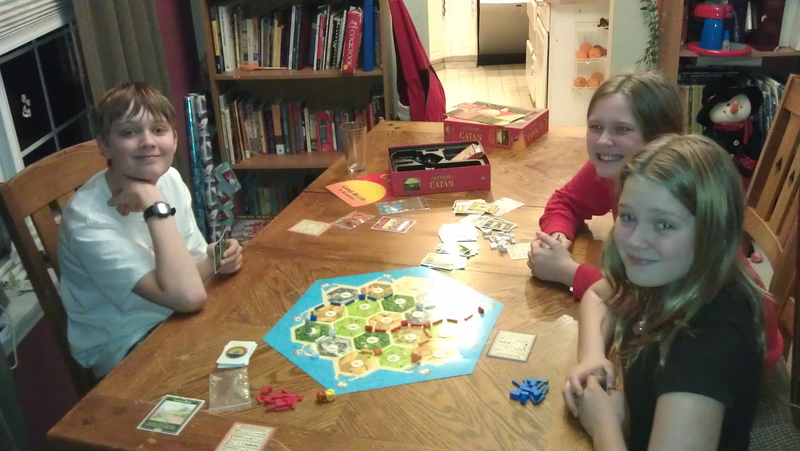 Vacation week, and a few hours Setting Catan with the kids was the name of the game. Given how poorly I placed, I suspect my settlers were pretty lazy. This entry was posted in Around the House and tagged giving more, Giving Our Time, meaningful giving, postaday2011, tradition, traditional giving. Bookmark the permalink.